Had a great experience diving the Great Barrier Reef today. 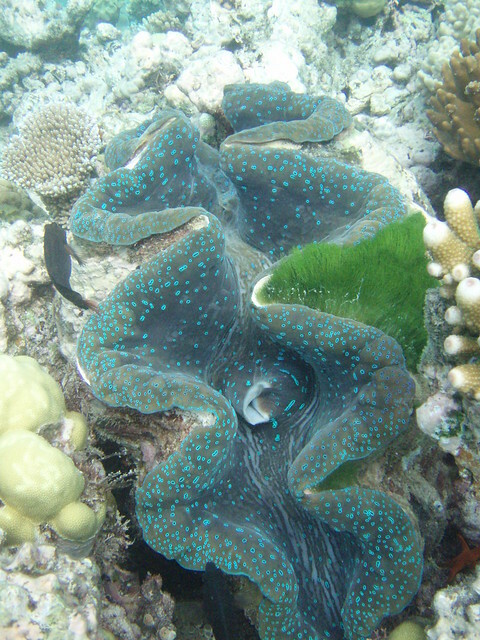 Lots of amazing wildlife, but the most amazing new thing I saw was the Giant Clam. These things are pretty cool. They have a similar lifespan to humans! I went on the Silver Sonic and would recommend them highly. The divemasters were very good and the crew was super nice and helpful. They warned us a few times about the high winds today and gave us the opportunity to reschedule. I didn't have the luxury of changing the date, so I went for it. Man, was it rough. About half the passengers lost their breakfast on the way out. I took some of the complementary ginger tablets and that did the trick on the way out. On the way back, after eating a bit too much for lunch, it was a real challenge to hold down my lunch, but I barely made it. We did three dives, two of them drift dives where you drift along the reef and meet the boat at the other end. Besides clams, I saw a medium sized shark, a turtle, and tons of interesting coral, fish, and mollusks. The divemaster would occasionally point out things we might have missed or hand us some creature that is safe to handle, like a starfish or sea cucumber. Even though it was rough getting out and back from Port Douglas, it was worth it for me. I'm not sure the snorkelers on the trip would agree though.